Brookhaven Retreat LLC, a unique residential treatment facility exclusively for women with mental health and/or substance abuse issues, announces their booth #1513 when they exhibit at the American Psychiatric Association’s 2016 annual meeting in Atlanta, GA, May 14-18, 2016. Brookhaven Retreat ® LLC, a unique residential treatment facility exclusively for women with mental health and/or substance abuse issues, will exhibit at the psychiatry event of the year, the 2016 annual meeting of the American Psychiatric Association at the Georgia World Congress Center in Atlanta, GA from May 14 to 18. Brookhaven Retreat offers a unique voluntary residential program of mental health and substance abuse services designed to help women overcome depression, trauma, anxiety, personality disorders, and substance dependence among other diagnoses. Jacqueline Dawes, owner and founder of Brookhaven Retreat, and her team will be at the 20x10 exhibitor booth #1513 answering questions about The Lily Program®, a 90-day individualized mental health treatment program offered exclusively at the Tennessee-based treatment center. Visitors of the booth can enter a drawing to win prizes and receive a messenger bag with information about BH and additional giveaways. Originally established in 1844, the meeting has remained the premier gathering in psychiatry today and serves as a symbol of the Association’s commitment to improved patient care through professional education. Hundreds of educational sessions and presentations on the latest research will be featured. 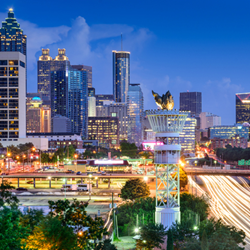 More than 13,000 attendees from around the globe, including physicians from psychiatric and other mental health disciplines will gather at the Georgia World Congress Center, the first state-owned convention center established in the United States, and now the third largest convention center in the country. Attendees will gain insight and in-depth knowledge designed to help improve patient care by meeting with renowned experts, earning credits, building peer relationships, discovering ground-breaking technology and new therapies and treatment options.